Many low-income children enter kindergarten with a significant learning gap compared to wealthier peers. By age three, a child from a low-income family would have heard 30 million fewer words in her home environment than a child from a wealthier family.1 And research shows that it is difficult to make up that gap over the course of a child’s education. 82% of low-income fourth graders fail to read proficiently at grade level, compared to 58% of U.S. fourth graders nationally.2 Intervening early to improve literacy skills and literacy instruction in preschool or primary classrooms can help to close the achievement gap in reading. Supplement preschool curricula and mobilize volunteers to bolster the pre-literacy and school readiness skills of the children most at risk for falling behind. Started in 1993, Jumpstart partners with preschools serving low-income children (for example, Head Start programs), and trains volunteers to deliver a research-based, structured early literacy curriculum twice a week for two hours during the school year. Since 1993, Jumpstart has served over 76,000 children and currently has programs in 14 states and in Washington, D.C. As it has grown, Jumpstart has served an increasingly diverse population; approximately three in ten children participating in Jumpstart do not speak English as their primary language at home. Jumpstart volunteers read stories to children and discuss them afterward, prompting the children to ask questions and helping them to build their vocabulary with words drawn from the story. Each volunteer works with small groups of two to three students over 20 weeks. The program also provides information to parents about what the children are learning and how best to support their child’s development. Volunteers are drawn from Jumpstart’s network of partnerships with colleges and universities; each volunteer is trained extensively, receiving at least 30 hours of training before starting their volunteer work. Volunteers receive a nominal stipend for their work and to cover transportation and other costs incurred while volunteering. Jumpstart also runs annual campaigns, such as the “Read for the Record” campaign, to raise awareness around the importance of literacy and early childhood education. Jumpstart’s model has evolved in response to ongoing evaluation efforts. The original program design matched individual students one-on-one with volunteers. Participating students were pulled out of the regular preschool classroom to attend their Jumpstart session. Removing students from their regular classes proved logistically difficult, however, and in 2009-2010 Jumpstart developed and piloted a new curriculum, drawing from research on effective literacy content and practices, to serve whole classes with small group instruction. Program designers believe that this model allows them to serve more children without compromising the positive results. 68% of Jumpstart students made greater gains than comparison students on a widely used measure of kindergarten readiness, the Bracken School Readiness Assessment (BSRA), while 71% showed larger gains on a common test of early reading skills (the TERA 3). In fact, the average gain for Jumpstart students was more than two and a half times as large as the comparison group on both tests. Broader participation in a national reading day. Participation in Jumpstart’s “Read for the Record” campaign day in support of early literacy has grown every year, reaching 2.3 million adults and children in 2014. The yearly all-in cost per Jumpstart volunteer ranges from a low of $1,640 for individual college or university based programs (on average) to a high of $4,220 for the Northern California based program. Cost differences by site relate to program age (start-up costs are higher than maintenance costs), whether a program is based regionally or at a single university, and the extent to which a site receives in-kind contributions from university or other partners. Jumpstart receives government funding for volunteer stipends through the federal AmeriCorps program. In 2013, 41% of Jumpstart revenue was from government sources, with 59% from private sources, including foundations, corporations, and individuals. 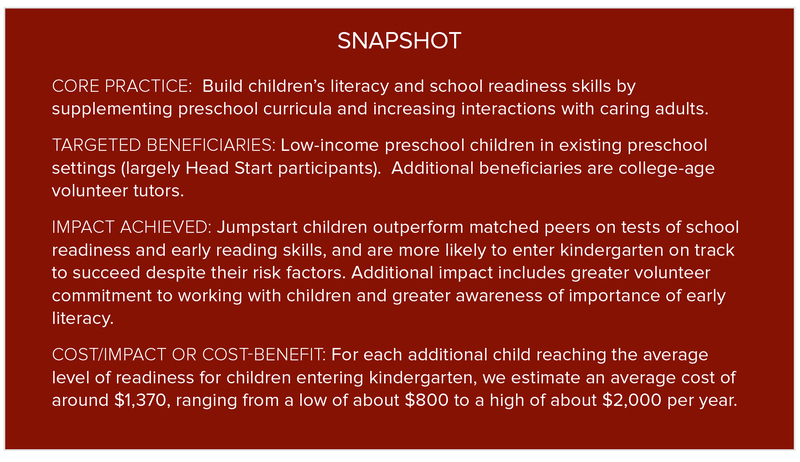 To estimate the cost per impact, we combined the average yearly cost of a Jumpstart volunteer (who works with two to three children) with existing impact data on kindergarten readiness results. For each child reaching the average level of readiness for children entering kindergarten, we estimate the cost to be about $1,370.8 Given regional differences in stipend amounts and in-kind contributions to the program, that number varies by site; the estimated range spans a low of about $800 to a high of about $2,000 per child, per year. For additional information on linking cost and impact, click here. Take Action: Use this online mapping tool to locate current Jumpstart programs and their local implementing partners. Click here for suggestions of other programs that prepare kids to be strong readers. 1 Rosenberg, T. The Power of Talking to Your Baby. The New York Times, April 10, 2013. Retrieved from: https://opinionator.blogs.nytimes.com/2013/04/10/the-power-of-talking-to-your-baby/2 Fiester, L. (2013). Early Warning Confirmed: A research update on grade level reading. Annie E. Casey Foundation, Baltimore. Data from 2011 National Assessment of Education Progress (NAEP). 5 We were unable to find a study of BSRA outcomes that used a representative sample of children with multiple risk factors. Studies of other school readiness measures do reveal that these children perform below national averages. A recent Memphis study, for example, found that while children with no risk factors (such as living in poverty, or in a house where the first language is not English) scored close to the national mean on the PPVT (100), those with three or four risk factors scored well below (75 and 59.7, respectively). 6 Dwyer, J. (2012). Investigating the relationship between support for vocabulary development in Jumpstart classrooms and children’s vocabulary development. Unpublished Manuscript, Boston University, Boston, MA. 7 Hecht, D., Cavanagh, A., Almendral, C., & Kaufman, D. (2013). A study of Jumpstart Corps members. Unpublished Manuscript, City University of New York, New York City. 8 This estimate uses the BSRA results from a study of the previous model and assumes that gains from the new Jumpstart model are in line with gains from the old; internal assessments to date support this assumption.